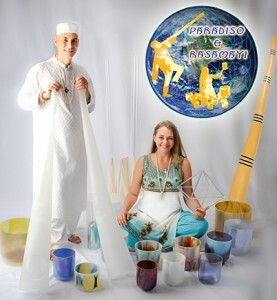 Paradiso & Rasamayi return to the Lifesource Yoga studio for the only Summit County stop on their Celestial Resononance: Journey into the Infinite Heart CD Realease Tour. Join us at 7:00PM for a delightful evening of beautiful resonant sound & powerful vibration. Paradiso & Rasamayi are nationally recognized for the power and beauty of their performances so prepare to be restored, refreshed and enlivened. This is a unique opportunity so don’t miss out. Spots are limited so call, stop-by or purchase your tickets online now! If you have a mat, bolster and/or blanket, please bring them along in case there are not enough at the studio to go around.